They say dogs are man’s best friend, but there might be some truth to animals in general being good friends. A new study published online in Developmental Psychology found that being around animals can lower social anxiety in children with autism. The study used guinea pigs, and had children read a book to themselves, then to two other children, then had playtime with guinea pigs. Children with autism disorders had higher levels of anxiety than children without autism when reading silently and to others, but their anxiety dropped significantly when they played with the guinea pig. This isn’t the first study done to show similar findings; we shared a similar study back in January. 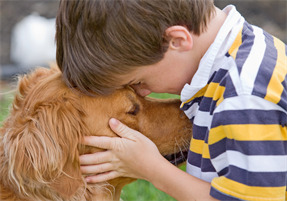 It is thought that the unconditional acceptance that animals give helps a child with autism feel more secure and safe. More research needs to be done, however – researchers are not suggesting that everyone who has a child with autism should get a pet. For now, if you have a niece or nephew with autism, talk to their parents about taking them to a pet store to see the animals – it may be a great stress reliever for everyone, and can even help lower anxiety.